TeamHealth, a provider of outsourced hospital-based clinical and administrative services, will contribute $25,000 to Miracle Flights, a charity providing free commercial airline tickets to help children and their families obtain special medical care. Las Vegas-based Miracle Flights received the most votes from attendees at the American College of Emergency Physicians conference in October. Five other local charities — Sunrise Children’s Foundation, Three Square Food Bank, Ronald McDonald House Charities of Greater Las Vegas and the American Foundation for Suicide Prevention — were also finalists. 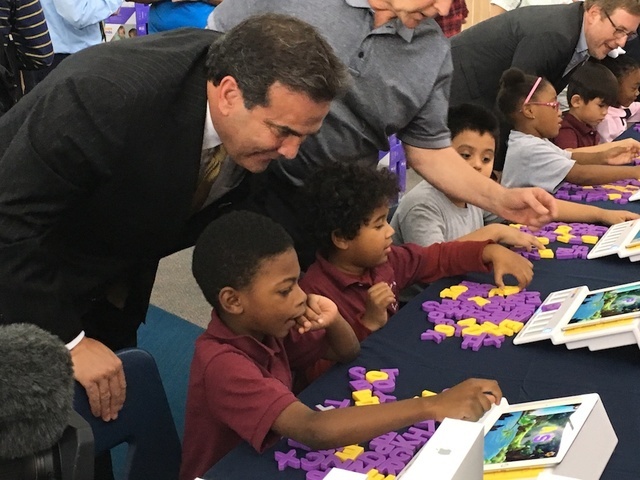 Bank of Nevada is helping the Andre Agassi College Preparatory Academy participate in a research project to help Nevada students attain reading proficiency by third grade. On behalf of Bank of Nevada, CEO John Guedry on Nov. 1 donated 42 iPads during a special presentation at the Andre Agassi College Preparatory Academy. The iPads will let the school’s students access Square Panda, a multisensory program offering 14 levels of instruction using tactile, visual and audio phonics lessons. The program measures each child’s progress, challenges, preferences and patterns of play. Stanford University professor Bruce McCandliss is consulting with Square Panda’s maker and the Andre Agassi College Preparatory Academy to analyze student results and assess how children learn. Project 150 is working to provide at least 1,500 local high school students and their families with a Thanksgiving meal and other necessities throughout the year. Some 2,500 Clark County School District students are homeless, displaced or disadvantaged. Project 150 relies on community support to provide them meals, which cost about $25 and feed a family of four. Deliveries will be made to each of the 51 CCSD high schools that Project 150 serves. This year, Project 150 is partnering with Three Square Food Bank to receive donations from Albertson’s Grocery Stores through their “Turkey Bucks” program, which lets shoppers donate money for the holiday meals through Dec. 21. Landsberg Orora will again provide packaging supplies to box the holiday meals. Project 150 will repeat this effort and deliver meals to high schools in December for Christmas. To join the #FeedItForward effort, call Project 150 at 702-721-7150 or visit project150.org. Catholic Charities of Southern Nevada called on the community to help collect 4,000 frozen turkeys and assorted fixings and desserts as part of its Thanksgiving Turkey Drive. Catholic Charities started the drive Nov. 10 with the pardoning of a live turkey provided by Gilcrease Nature Sanctuary. Catholic Charities’ annual turkey drive is the Las Vegas Valley’s largest turkey giveaway. Frozen turkey and food donations will be accepted through Nov. 23 at Catholic Charities of Southern Nevada’s campus, 1501 Las Vegas Blvd. North. Volunteers are also needed to distribute turkeys and help at the food pantry from now until Nov. 23. Volunteers can sign up at catholiccharities.com. As part of its partnership with the Marine Toys for Tots Foundation, the Las Vegas Review-Journal is one of the toy drop-off locations this holiday season. Donate a new, unwrapped toy for children in need from infants up to 14 years old at 1111 W. Bonanza Road. Donation deadline is Dec. 15; donation boxes are in the reception area. 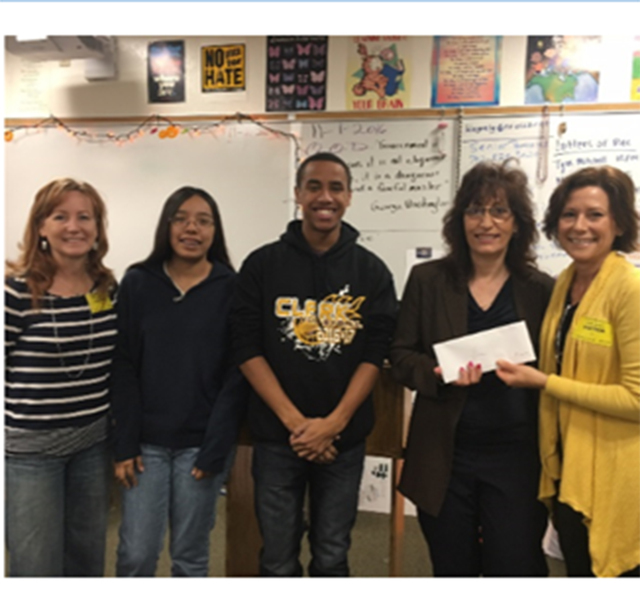 Henderson Give, a giving circle started in 2007, presented Luanne Wagner, the We R Community coordinator from Clark High School, with the organization’s “Golden Give” to recognize all she does to assist her students. The group termed this donation as its Golden Give. Over the last eight years, the group has donated $50,000 to dozens of people, organizations and causes valleywide. A giving circle consists of committed individuals who pool resources to support causes they care about. At the group’s monthly meetings, one member chooses a cause or charity to help. Each of the 12 Henderson Give members donates $50 for a monthly total of $600 each month. Gramercy courtyard at 9265 W. Russell Road is the place for Paws on the Patio, 5 to 8 p.m. Nov. 29. People from all over the valley with their pets with come out and shop from vendors. $25 of each booth sale will be donated to Pal Humane Society. Paws on the Patio raises awareness about animal cruelty, rescuing, fostering and adoption. They support a nonprofit every month by gathering pet food donations, pet items and by providing a free booth for the animal organization to collect donations for vet bills and hold a raffle. For more information about Pal Humane Society or to donate pet food contact Alissa at 702-629-6351 or visit palhumane.org. Frank L. Stile Foundation is hosting a Holiday Giving Winter Carnival from 6 to 9 p.m. Dec. 2 at 8954 Spanish Ridge Ave., Suite 1. The event is open to the public and features rides, carnival acts, games, toy drive, food and drinks. The highlight of the evening will be the FLS Foundation Giving Event, with major donations to Three Square, The Shade Tree and St. Jude’s Ranch for Children. The FLS Foundation will present a check for 500,000 meals to Feeding America, an organization dedicated to feeding the hungry throughout the United States. In celebration of five years of successful giving, the FLS Foundation Holiday Giving Winter Carnival will commemorate 1 million-plus meals served.